Le Chat. – Life Is Such A Sweet Insanity. Truman makes the oddest chirping noise when he spots a laser dot on the floor. I haven’t heard cats make this noise other than when they see birds outside and they’re inside. But Truman chirps and chirps and chirps as he gallops around chasing the laser pointer. I decided to look this up and researchers believe cats make this noise when they’re trying to hunt something they can’t physically get at, like when a bird is sitting on a branch outside and the cat is stuck inside. 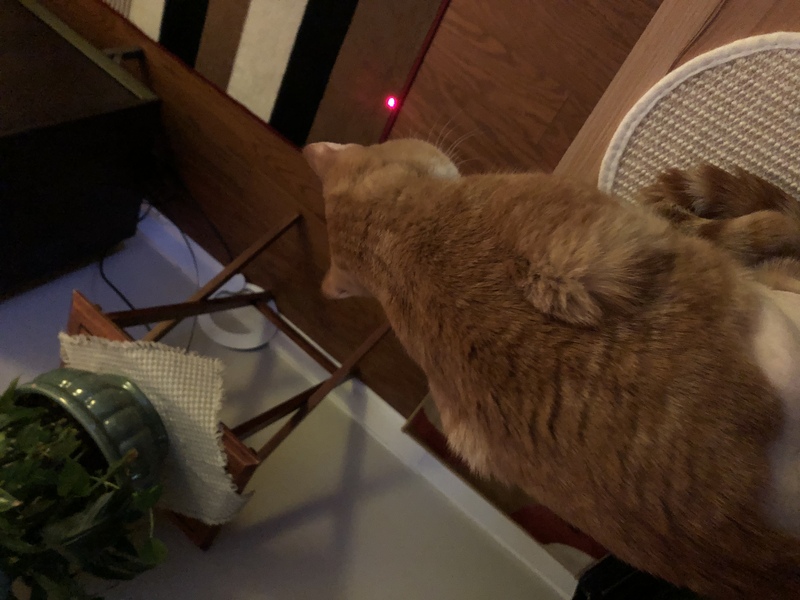 Truman doesn’t see anything physical associated with the red dot on the floor, other than the dot itself, and therefore he apparently starts chirping trying to attract its attention. One of these days he’ll get this dot. I have an editor in chief that insists on monitoring all my blog entries. He isn’t good at proofreading though. I’ve mentioned before that Tom likes to play a game with me during lunch. There’s two parts to this game. Part one is to see what brand new, never heard before obscene, shrieking, loud, deafening noise an eleven year old cat can make while standing in front of the door. This is a subtle request for immediate egress, and if not answered promptly is accompanied by claws on the door casing. Part two is to do exactly two 360 degree rotations just outside the door, sniff the air a couple of times and then stand in front of the door waiting to be let back in. He will not start part two until the door has been closed and I have been seated back at the kitchen table. Then it’s show time. So here’s a picture I took as part two comes to an end. He’s waiting for a bite or two of kibble (I usually wish him a ‘bon appetit mon chat’ as he walks over to the bowl), then he’ll race around the house like his tail is on fire and then park in front of the door again to make another heinous noise. I sometimes wonder who has the more rigid schedule. So I come home for lunch to piano music. Well not music, but just a bonking sound coming from the piano. Tom had run up the piano keys just as I was walking in the door. He’s never done that before. Now he’s tearing around the house like a maniac. He jumped in his litter box, did his thing and ran out so fast the damn thing almost tipped over, then he bolted up the stairs and came back down, jumped up on the kitchen table and then bolted for the piano again but refrained from playing a second number. I think he’s getting a little stir crazy for spring. I came home at lunch to write a typical blog entry about life being insane and all when someone demanded all my attention instead. Here Tom is in his “I’m going to pretend to look out the door during this photoshoot” pose. Isn’t he cute.